Thought I,d have a butchers at the FORUM , and was shocked to find that only 37 people viewed the posts today , so in my investigative mode I went back exactly 9 years ago today to read the posts then , and coincidence or what, the head subject was Nostalgia and very interesting it was . Good to see Mick flying the flag yet again . The reason I was tracking back was to check how many viewings the post had compared to the dismal number today , but It did,nt show , funny that , I,m guessing it wouid have been many many more . Hi Ed, nice to see you keeping the barrel rolling, it is a mystery as to where the past regular posters have disappeared. Just like the docks, once a lively industry & within a very short span closure. Where are all the posters from latter years, that could kickstart our once popular forum? Mick & Harry pop in from time to time with some interesting items but with very little follow-up. What would help is the return of the ability to post photos, that would really wake things up. The statistics show that the most people viewing posts occurred as recently as October 2018 (233) which I find a bit of a surprise. If only some of the viewers to the site each day would take the step and contribute then things might take off again. Certainly the situation that occurred 3 or so years ago when the forum was taken down without warning was a contributory factor to the situation. Some time after that I know that Linda and I were invited to be Moderators for the group by London Borough of Newham and we both attended meetings on different occasions at Stratford Library. They were due to discuss the situation "in house" and get back to us but I didn't hear any thing further. Photos often stimulate interest far more quickly than the written word and the fact that it is so difficult and, virtually impossible, to post photos to the site is a major contributory factor to the apparent lack of postings. I know that someone us, Linda, Mick and myself, have joined Local History Groups on Facebook where we have occasionally "bumped" into each other and certainly some of the items posted within those groups would be good subjects for this site. Ken, It is still possible to post photos on this site, provided the come directly from a internet website. I trust Doug does not mind, but as an example, the picture below of the portico to Manor Park Library, is one that Doug posted to the Newham History Society Group on Facebook. Although the picture appears to be part of this message, it is actually coming direct from a Facebook computer. It is the original Doug posted and is not a copy. To be able to do this while either creating a new post or replying to an existing one, click on the far left icon of the middle row of icons above the text box and you will see the text *[*img]**[*/img]* inserted into your message. Please ignore the asterisks (*) as I have had to put them in to stop the computer attempting to interpret the text as computer coding. In-between the text *[*img]* and the text *[*/img]* is where you put the web address of the image you are trying to add to your message. 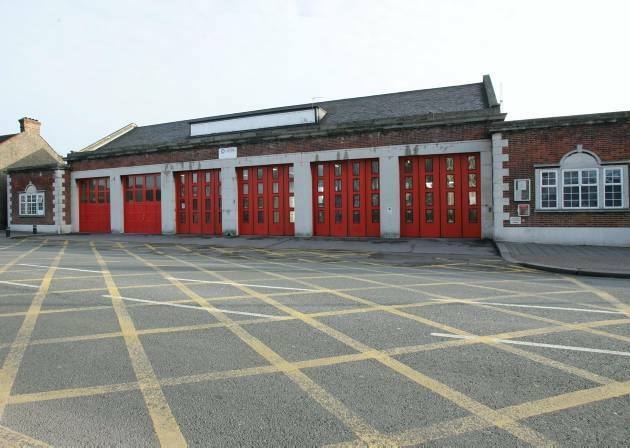 For instance, the picture below of the old Plaistow Fire Station is stored on my own private website. If you right click your mouse on the picture and highlight properties you will see where the picture is stored on my website at https://micksmuses.files.wordpress.com/2018/09/plaistow-fire-station-02.jpg. You simply copy and paste the web address of the picture between the text I mentioned earlier. You can always use the "preview" facility to see if your imagee has come out correctly before you post your message. Using this method, you can add pictures you find on the internet to your message. Although you cannot add pictures stored on your own personal computer, you can first upload them to a free picture imaging website like Flickr and then copy the web address from there. Hi Mick, a photo hosting programme that I find handy is Photoimage which will allow images from your computer to be posted. Copying an image from an internet websight into your picture folder is straightforward, then to Photoimage into forum. Come on you posters give it a try & get clicking. Ed facebook is a waste of space, all it seems to be are pictures of places that already been published on the net already and silly things like: name your favourite sweet, or what road did you live in questions, etc, which receive several hundred one word replies. the problem is that it can be very addictive, if you let it! Ed, I don't think anyone was suggesting that anyone should try out Facebook. Cumulatively what was being said that when this board closed down suddenly, many previous subscribers migrated to Facebook. As for my contribution of how to publish photographs on this site, I used a picture that Doug had posted on Facebook and one from my own website, purely as illustrative examples of how images on different websites can be displayed. I could have used images from any of the one billion plus websites there are now estimated to be in the world. I am sorry you found my instructions of how to display pictures a little perplexing, it is far more simple to do than explain. It's rather like learning to ride a bike or driving a car. Many think they will never get the hang of it and then Hey Presto, everything suddenly seems to come together. I think all social media websites have their pros and cons which different people may either like or dislike. I agree with Nollanhej that often there is a lot of drivel on Facebook, but again the same could be said about many novels in a book shop. One has to sort the chafe from the straw according to ones own particular preferences. Age is certainly not a barrier to trying things out. I myself am now in my 70's and you might remember one regular contributor "Ex Custom House" who was by no means a spring chicken and was willing to try new things. It was only when her eyesight had seriously deteriorated, that she was forced to stop using this board. Again it is all up to the individual. One thing this site was exceptionally good at in the past was in-depth debate by knowledgeable contributors on various subjects. That is something I rarely see on Facebook except in specialised groups. I suppose at the end of the day, it all boils down to what any particular individual feels comfortable with. nollanhej, its nice to see you back, I agree Facebook can be a bit of a pain, but it is another form of communication allowing posters to keep in touch. The Newham Forum required the post to be Newham based which could be a little restrictive at times. ed, Mick is a wizard on posting photos & when you have the ability to insert photos into your post it opens up a new interest. Give photoimage a try, it should not break the bank. Thanks Ken, it's a pleasure to be back! By the way what's your favourite sweet? One thing I did learn on FB was that in the 'sixties I thought the only venues for live pop music were the Bridgehouse, Canning Town, and the Two Pudding, Stratford. Because I was a young married family man I never had any desire or inclination to go to music clubs and pubs. To my surprise, I have learned that some now very famous bands played in lots of pubs and clubs in east London. I was very surprised to see the two above mentioned venues didn't have a monopoly of the music scene. Well that's me told , Ken like me you have a woodworking background ,do you still yearn for the hand skills like planing timber by hand instead of plugging in the electric planer or what about the battery power screw driver , now I like that one but still tell the youngsters I prefer to do it by hand , I lie of course only because Iv'e had operations on both hands so very difficult to grip , coming back to nostalgia I love the old tools but embrace the new technology , but if suddenly our electricity gets taken away ,at least Ken and myself can cope albe it slower , where as most youngsters with woodwork tools are looking around for a socket to plug into , possibly a bit harsh but you get my drift. Hi Ed, my DIY is done using a wheelbrace & pump screwdriver, not an electric cable in sight to trip over. Planning is done using a steel Stanley jack or smoothing plane which gives a nice finish, a quick rub over with sandpaper with cork block, job done. I can still look a box of chocolates in the eye & walk away. nollanhej, (https://postimages.org/). can you remember these? sweets were part of your sugar ration, so therfore no sweets. I was 7 years old before I go my first sweets due to post-war sugar rationing. I always remember them as they were a tube of Refreshers my mother gave to me. I took them to school and showed them off, (still unopened), to my class mate who sat on the double desk next to me. Before I knew it, just like the hand of God descending from the clouds, the hand of the tyrannical female school teacher we had, suddenly descended and confiscated them and put them in her desk. I felt really miffed, I had not even tasted one of the first sweets ever given to me in my life. I used to go home for dinner and told my mum about it. Later that afternoon during class, the class room door suddenly flew open so hard is crashed against the wall and gave everyone a start. Framed in the doorway was my mum who promptly went over to the teacher, held her hand out and said my sons sweets please, Although that is all she said, her tone of voice had an 'or else' implied in it. The whole class looked on amazed as the teacher who normally took great delight in terrorising us all, meekly open her desk and placed the tube of Refreshers in my mums hand. My mum simply said thank you, turned around and walked out the class, but again the tone of her thank you had the implied, I will be back' threat implied in it. As for myself at the moment I wished the earth would swallow me up as I awaited the fearsome retribution that would follow from my teacher. As it transpired not another word was said and my teacher was a good as gold to me after that. I don't think she relished the idea of another visit from my mum.